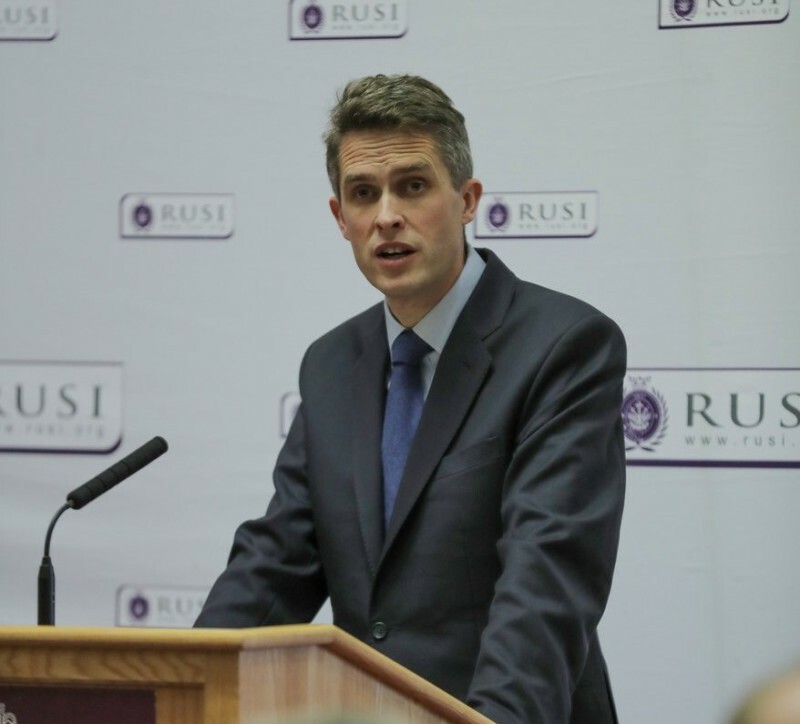 Defence Secretary Gavin Williamson gave a speech at RUSI outlining the future direction of the UK Armed Forces. Below is the full transcript of the speech, exactly as it was delivered. Today, we see a world of spheres of influence and competing great powers. Not only are we confronting a state like Russia. An ideological enemy without a state like Al Qaeda and Daesh. But the very character of warfare itself is changing. The boundaries between peace and war are becoming blurred. Our adversaries are increasingly using cyber-attacks, subversion and information operations to challenge us and the rules-based international order. Operating in the ‘grey zone’. Operating below the threshold of conventional conflict. Our Joint Forces Command is already dealing with this. But we need to go further. We need to bring together our strategic capabilities. We need to integrate them more effectively and a greater agility to meet the demands of this increasingly contested environment. NATO. 70 years on from its founding, remains the bedrock of our nation’s Defence. In the past five years, the Alliance has come a long way. It is far more focused and ready to deter and defend against Russian hostile acts. But more European nations need to be ready and capable of responding too. Stepping up to the 2% NATO target and not being distracted by the notion of an EU Army. And in NATO, we must stand firm against Russia’s non-compliance with the INF Treaty. If necessary being ready to deal with the threat that new Russian missile systems may pose. The Alliance must develop its ability to handle the kind of provocations that Russia is throwing at us. Such action from Russia must come at a cost. Nor, can we forget those countries outside NATO who face a day-to-day struggle with Russian attempts to undermine their very sovereignty. We stand ready to support our friends in Ukraine and the Balkans. These countries have the right to choose their own destiny and be free from Russian interference. At the same time, in such an uncertain age, like-minded nations must come together to increase their own security. That is why the United Kingdom is leading the nine-nation Joint Expeditionary Force which in a few months’ time will take part in its first deployment to the Baltics. From this spring, HMS Montrose, along with five other naval vessels, will be permanently based in the Gulf using innovative crewing and support methods to keep the ship available for more of the time. Today, we also go further. And I can announce the first operational mission of the HMS Queen Elizabeth will include the Mediterranean, the Middle East and the Pacific region. Making Global Britain a reality. Significantly, British and American F-35s will be embedded in the carrier’s air wing. Enhancing the reach and lethality of our forces and reinforcing the fact that the United States remains our very closest of partners. We share the same vision of the world. A world shaped by individual liberty, the rule of law and, of course, the tolerance of others. We have the unique ability to integrate with US forces across a broad spectrum of areas. And, we are more determined than ever to keep working together. Turning to our Royal Air Force, fresh from celebrating its centenary last year, it is now firmly focused on the next 100 years. They already have 17 new RAF and Royal Navy F35 Lightning jets, capable of land-based operations anywhere on the globe and due to embark on our aircraft carrier for the first time later this year. We’ll soon have nine new Poseidon P-8 Maritime Patrol Aircraft enabling us to patrol thousands of miles of ocean and greatly enhancing our anti-submarine and maritime capability. We’re upgrading our AWACS aircraft with modern and better capability that will improve our battle winning airborne command and control. We are growing our operational Typhoon squadrons from five to seven - equipping them with world leading radar and now carrying deep strike Storm Shadow cruise missiles. They are contributing and they are the key capabilities that guard UK airspace and waters. They are supporting the civil authorities right across the United Kingdom. They are ensuring that we remain a leading member of NATO. They are protecting our interests and enhancing our prosperity. And they are showing, they are showing that Britain still matters on the global stage. Some still wish to cut Britain down to size and send her back to her shores. But to those, I say that has never been our way. It is not in our nature. Britain has always sought to take risks. Britain has always stood up for its deeply held values. Britain has always been an outward looking nation. And against adversaries upping their spending…investing in new technologies… we have to respond. If we do not, we will find ourselves with fewer options when we face the challenges and the threats in the future. (EDITOR’S NOTE: The picture of resurgent British military might painted above is attractive, but given the state of the defense budget – whose equipment plan is underfunded by anywhere between £10 and £20 billion – it seems a pipe dream. This is particularly true of the new weapons described by Williamson, such as the Littoral Strike Ships and the drone swarms, neither of which had been previously made public, nor been included in the 10-year equipment plan. Given these financial constraints, it is hard to imagine Britain having the funding to pay for extended operations East of Suez. The defence secretary’s brain has gone absent without leave. Gavin Williamson said in a speech today that he intends to send his new aircraft carrier, the HMS Queen Elizabeth, round the world to frighten China. He will equip it with a squadron of F-35 fighter jets, purchased from America. In addition, he wants to build two British military bases, one in Asia and the other “in the Caribbean”. They are to “strengthen our global presence, enhance our lethality and increase our mass”. His budget was last week said to be £7bn adrift of reality. The Queen Elizabeth cannot sail until 2021. It has no business whatsoever in the South China Sea, where such a vast and unwieldy ship would be a sitting target. The Chinese could sink it in an hour. As for new military bases in the Caribbean and east of Suez, they would cost billions and be an invitation to terrorists. The Chinese must be laughing themselves sick. Brexit has nothing to do with British foreign or defence policy, since nor did membership of the EU – except that it might involve staying on good trading terms with the Chinese. As for Williamson’s eagerness to go to war against “international law-breakers”, can he not recall the last three times his department tried that, in Afghanistan, Iraq and Libya? Click Click here for the full story, on The Guardian website.